_Vishnu’s next incarnation was in the form of a boar .GOD decided to create a creature that could live on the land alone. The boar lives on land only. This means in the order of evolution land based animals evolved. It is called Varaha Avatharam. The sage Kashyapa and his wife Diti had two son's named Hiranyaksha and Hiranyakasibu brothers. they became the kings of the demans. These brothers were very cruel. Hiranyakasibu was the worst of the two. Hiranyaksha’s meditation pleased LORD Brahma and lord Brahma appeared before him and granted him the boon that he would be invincible in battle. Thus armed. Hiranyaksha went out to fight with the devas. He comprehensively defeated the gods and conquered heaven. He also defeated Varuna, the god of the ocean .Thus, Hiranyaksha became the king of the heaven, the earth and the underworld. But the demons was not particularly fond of the earth. He himself had begun to live in Varuna’s palace under the ocean. So he hurled the earth into the depths of the ocean. The gods went to Vishnu and prayed that something might be done about Hiranyaksha. They wished to be restored to heaven and they wished that the earth might be brought back from the depths of the ocean. 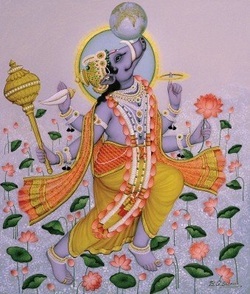 In response to these prayers, Vishnu adopted the form of a boar and entered the ocean. Who should he meet there but Hiranyaksha himself? Hiranyaksha of course did not know that this boar was none other than Vishnu. He thought that it was anordinary boar and attacked it. The two fought for many years .But finally, Hiranyaksha was gored to death by the boar’s tusks .The boar raised the earth up once again with its tusks. Vishnu thus saved the gods and the principles of dharma.